For the past year, the use of collagen has taken over many diets and skincare routines with the goal of encouraging collagen production to result in healthy hair, skin and nails. One of the main questions you may be asking yourself is why collagen? What is it anyways? Collagen is a hard, fibrous protein that makes up one third of the protein in our bodies and 70% of the protein in our skin. 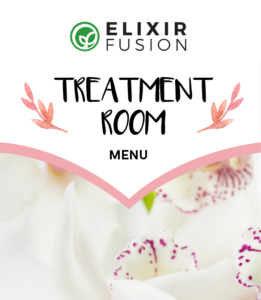 Since collagen production starts to decline from the age of 25, there has been a significant interest in boosting collagen production to slow the ageing process and to maintain healthy joints, nails and skin. Since collagen is resorbable, which means it can be broken down, converted and absorbed back into the body, there has been a rise in collagen supplements and creams. However, it must be noted that collagen will typically originate from an animal source and is therefore unsuitable for those concerned about our animal friends. Is there a plant-derived alternative? While there is no plant that produces collagen in itself, there are plants out there that act as polysaccharides that assist in collagen production and wound healing. 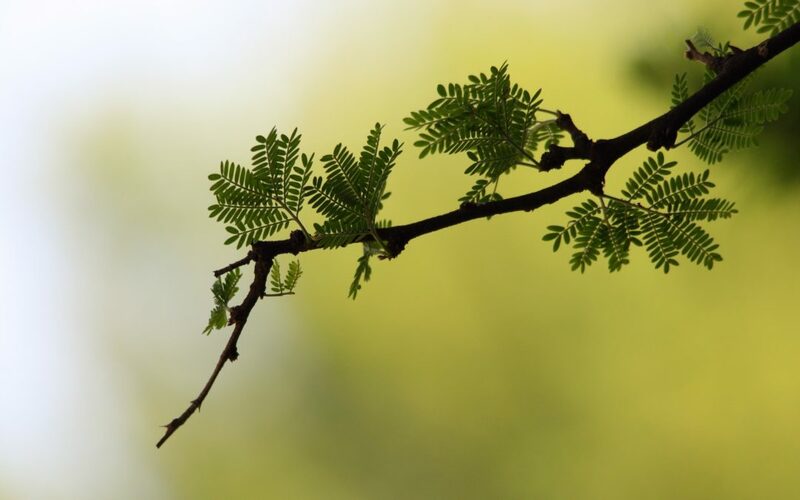 Certain plants also contain a range of essential amino acids, that when combined, can mimic collagen to allow for a functional equivalent to animal-derived collagen. The concept of plant-based collagen is fairly new, only starting to feature in products in the last year or so. 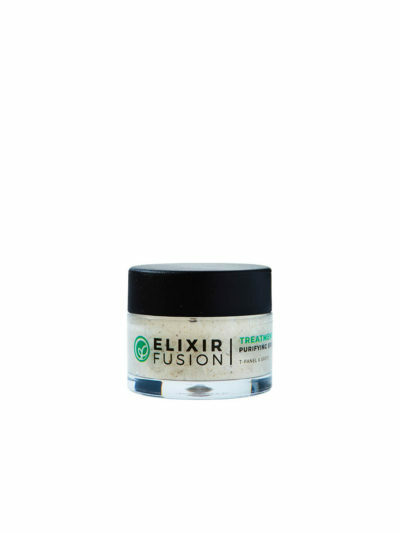 At Elixir Fusion we have been using plant-based collagen in our products for over 10 years. We strive to make our products cruelty-free and sought out an anti-ageing solution that would be as effective (if not more) than the animal derivative. 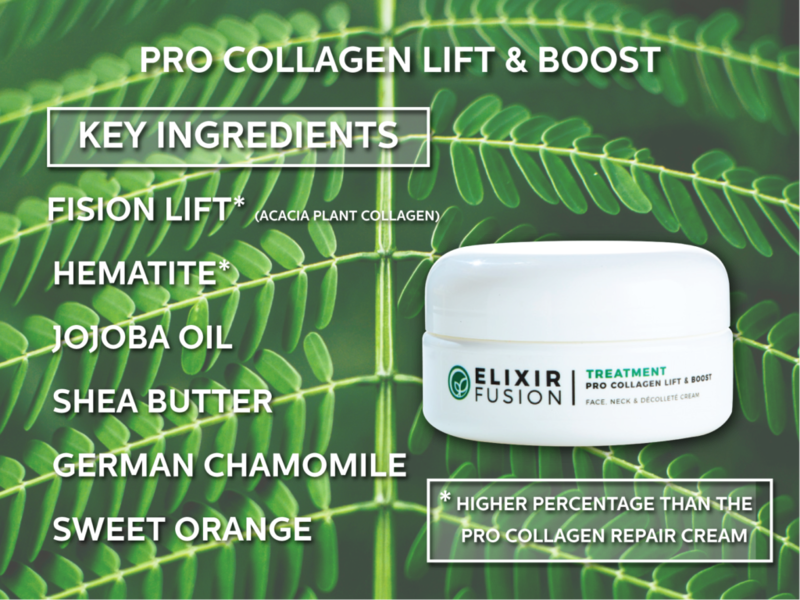 Our plant-based solution resulted in the discovery of two active ingredients- a plant-based collagen called Fision Lift and an active that serves to promote collagen absorption and production, Hematite. With 10 years’ worth of sales, we know it works! Why should I care about these actives? Our Fision Lift active has a main ingredient of Acacia Senegal Gum, which has been proven to help fill wrinkles and firm skin. When combined with proteins sourced from soy, wheat and corn, a special blend of essential aminos are created to provide you with a completely plant-based collagen solution. Being both natural and sustainable, our plant collagen works to improve skin firmness, improve skin elasticity, reduce the appearance of wrinkles and revitalise the skin. Hematite works to help the absorption of the plant collagen as well as stimulate collagen production. It is an iron-rich extract that aids the fighting of free radicals (which contribute to ageing), boosts cell metabolism, fights against thinning skin, and works to improve the dermal structure. Each of these active ingredients work to fight ageing on their own, but work together when combined to form a more complete natural anti-ageing solution that omits the need to rely on animal-sourced ingredients. 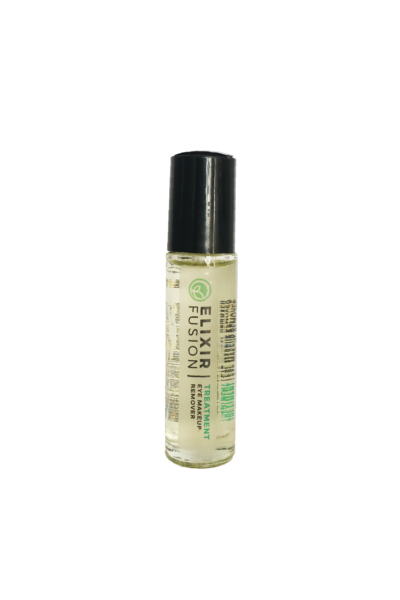 As Elixir Fusion is an aromatherapy-based company, we couldn’t leave our essential oils out of the mix. Our Pro Collagen products all contain German Chamomile and Sweet Orange essential oils to give an added boost to the active ingredients. Sweet Orange, in particular, is what makes the plant collagen absorbable due to its properties of boosting skin permeability. Limonene (the main ingredient in Sweet Orange oil) increases skin permeability more than any other compound tested, which means it is the perfect ingredient to boost the anti-ageing properties of our other added ingredients. German Chamomile works with these properties to manage sebum production, reduce puffiness, aid skin regeneration and improve skin elasticity. What more could you want from a collagen cream? This cream has been designed for skins that are looking for a light boost with attention to fine lines but at the same time without over feeding the skin. 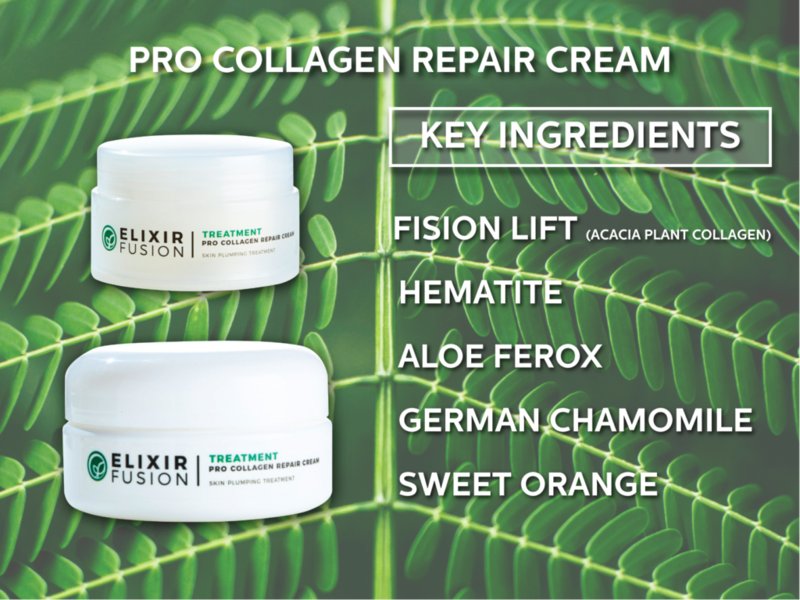 We have combined our plant-based collagen active with Aloe Ferox to ensure easy penetration and increase in oxygen supply to the skin, balancing the sebum. Naturally high in amino acid and mineral content, this particular ingredient only adds to the benefits of the plant collagen and makes sure your skin receives all the amino acids necessary to boost collagen synthesis- benefiting your skin in the long run. One cream, so many uses! 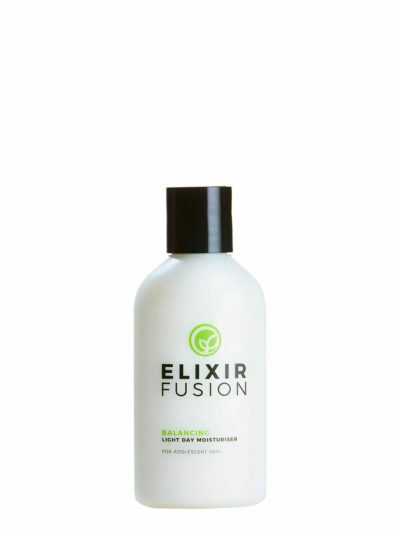 Plant based collagen actives and essential oils have been enhanced in a rich jojoba and shea butter formulation. This is for skins not only looking for plumping and smoothing out wrinkles but also deep hydration. For boosting and hydrating decollete and neck area. That is why we sell in in a 125ml container- you can never get enough of it! Our Pro Collagen Cream is available directly from our online store or any of our stockists.